You must submit a photocopy of your DD-214 displaying your Overseas service time. 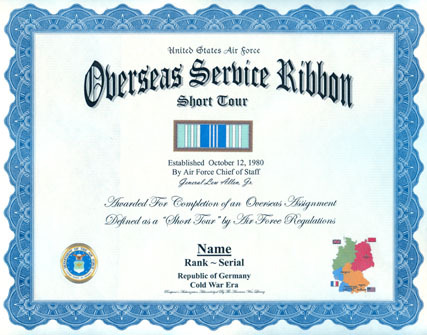 Click for larger image The Overseas Service Ribbon (Short Tour) was established on October 12, 1980, by the Air Force Chief of Staff, General Lew Allen, Jr. When originally established in 1980 no criteria was set for retroactivity which made the OSST retroactive to WW2 AAF personnel. In 1986 the Air Force re-set retroactivity to allow any current active or Reserve member who served overseas prior to 1980 to be authorized the ribbon. This ribbon is worn after the Outstanding Military Volunteer Service Medal and before the Overseas Service Ribbon (Long Tour). 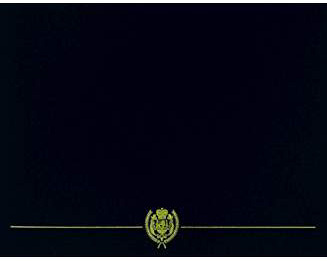 The Overseas Service Ribbon (Short Tour) may not be worn on the Navy or Marine Corps uniform. A Short Tour is whatever the Air Force determines it to be. A Short Tour is shorter than a normal tour for any given assignment area. If a normal tour of duty to Siberia is 12 months (which is the minimum requirement for receiving the Siberian Service Medal) but you were sent on special assignment to Siberia to be there only 4 months you would be eligible for the Short Tour Ribbon but not the Siberian Service Medal. Also, if your 4 month tour was extended to 5 months (or 4 months and 1 day) you would be eligible for the Long Tour Ribbon, but again, not the Siberian Service Medal because you were not in Siberia for 12 months (which is the criteria for receiving the Siberian Service Medal). 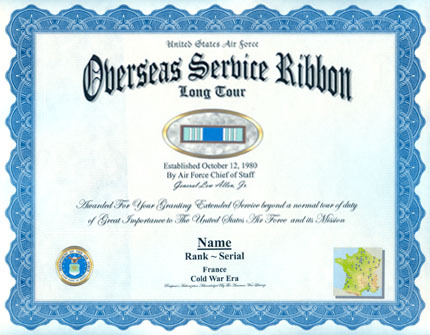 The Overseas Service Ribbon (Long Tour) was established on October 12, 1980, by the Air Force Chief of Staff, General Lew Allen, Jr. This ribbon is worn after the Overseas Service Ribbon (Short Tour) and before the Air Force Longevity Service Ribbon. The Overseas Service Ribbon (Long Tour) may not be worn on the Navy or Marine Corps uniform.